Where does everything in our daily lives come from? The clothes on our backs, the computers on our desks, the cabinets in our kitchens, and the food behind their doors? Under what conditions-environmental and social-are they harvested or manufactured? Veteran science journalist Fred Pearce set off to find out, and the resulting 100,000-mile journey took him to the end of his street and across the planet to more than twenty countries. In Confessions of an Eco-Sinner, Pearce surveys his home and then launches on a global tour to track down, among other things, the Tanzanians who grow and harvest his fair-trade coffee (which isn’t as fair as one might hope), the Central American plantations that grow his daily banana (a treat that may disappear forever), the women in the Bangladeshi sweatshops who sew his jeans, the Chinese factory cities where the world’s computers are made, and the African afterlife for old cell phones. It’s a fascinating portrait, by turns sobering and hopeful, of the effects the world’s more than 6 billion inhabitants-all eating, consuming, making-have on our planet, and of the working and living conditions of the people who produce most of these goods. "Pearce travels the globe, mapping how his purchases influence the world . . . Witnessing slave like conditions and unweaving the often circuitous and corrupt pathways of global trade, Pearce somehow remains optimistic." "In mapping his carbon footprint, Pearce is also taking a snapshot of humanity-the good, the bad and the ugly. Much of what he finds is grim. . . . But Pearce also discovers some good news stories. . . . The harsh realities make this book a difficult read, but Pearce's clear, familiar style draws the reader in . . . highlighting the corruption, child labour, sweatshops and ecological carnage spawned by our appetite for more stuff." "A brilliant, witty, unnerving look at the secret world of our stuff." "Pearce's findings raise complex questions . . . But his discoveries can help all of us make more informed decisions about our own purchases." "As we enter the holiday season, this book leaves me with one thought: Buy less, but spend more . . . Or, just buy this book for everyone on your list." 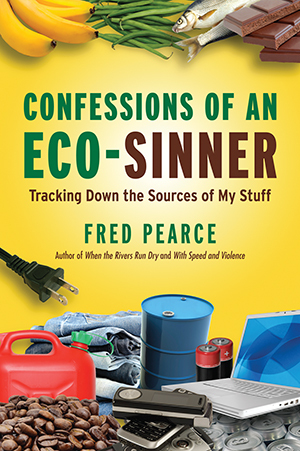 "Confessions of an Eco-Sinner (Beacon Press) . . . displays a refreshing ability to defy conventional green wisdom . . . Pearce examines the economic and environmental effects, for good and ill, of his own consumption. His message proves overwhelming at times. It's tough to bear the steady drumbeat of terrible backstories haunting your closets… Nonetheless, Pearce scores an inspiring read here, with a gift for getting to the heart of the matter in just a few words. When he notes, 'We want our ethics on the cheap,' many a reader will see herself in that assessment." "With a straightforward writing style and a pace that circles breezily from travelogue to statistics to history and back, Pearce's stories are not just about the objects he researches or the environment for which he laments; they're also about the people-farmers, traders, moguls-he meets along the way . . . So, will you be inspired to toss out your mobile phones, batteries, T-shirts, chocolate and countless other household items after reading Confessions of an Eco-Sinner? Probably not. Will you be tempted to throw up your hands and accept that globalization is a complex, confusing and at times frightening force? Maybe. But, if you read to the end, you might learn some helpful tips for doing at least something to become a more conscious consumer. The book's closing chapters on 'Why We Can Green Our Cities' and 'Why We Can Halt Climate Change' may seem like a drop in the bucket after the preceding case studies, but Pearce argues that they are the only hope for a more just and healthy future." "Pearce is especially hard on consumers, admitting he is guilty as anyone in the developed world . . . What he found was disturbing as it was predictable. In essence, we are guilty, guilty, guilty of wearing and consuming cheap products that are purchased at a heavy human price . . . Far from merely presenting a litany of consumer sins, however, Pearce discusses a range of socio-economic solutions, including recycling alternatives, agricultural initiatives and population issues." "In his new book, Pearce makes it his mission to trace the origins of everyday items he finds in his home . . . For a year Pearce traveled the world, both tracing the life cycle of these items but also meeting the people who produced them for him. It was an experiment that reinforced some longheld truths, but also shattered a few eco-adages/rules." "Fred Pearce is . . . a true investigative journalist: He'll dig-literally and figuratively-relentlessly until he gets to the truth. In his new book, Peace makes it his mission to trace the origins of everyday items he finds in his home: fair trade cotton socks from Marks and Spencer, the Acer computer he wrote the book on, his Saturday night shrimp curry dinner, and the can from which he drains the national drink of England, beer." "Confessions [of an Eco-Sinner] could easily have become an odious guilt trip of a book, but instead, it's packed with jaw-dropping stats and introductions to heroes . . . You'll never be able to hide behind the 'I'm just one person' excuse." "Journalist and author Pearce extends his exploration from the ecological to the social and economic implications of our 'stuff' . . . Through this book, readers will gain a holistic sense of global markets, and some actions (e.g., buying green beans from Kenya instead of beans grown locally in a hothouse) emerge as surprisingly virtuous when the true global impact is revealed." ". . . the author presents fascinating firsthand investigations." "Sometimes frightening, always enlightening, [Confessions] will teach you more about other people's lives than you ever thought possible."